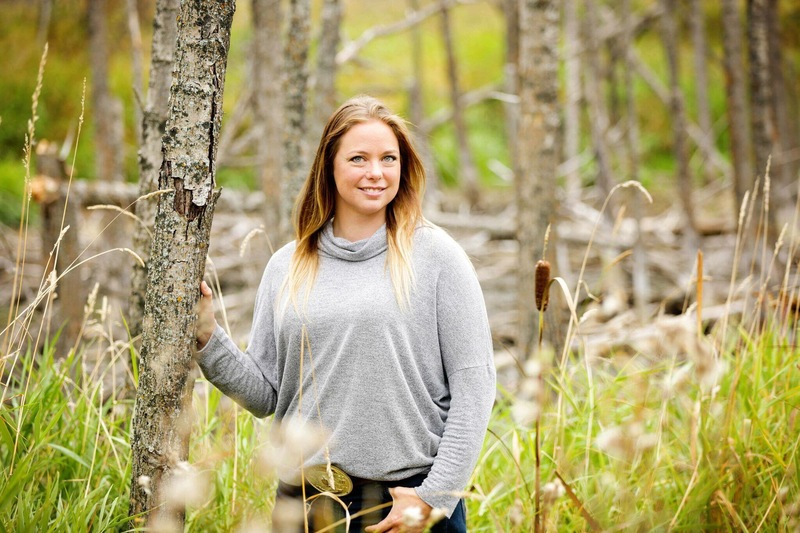 Recently an Agriculture Commentator, Kevin Hursh, from right here in Saskatchewan, sparked a heated debate with a tweet commenting on what women need to do in agriculture. The quote he tweeted about was from Jen Christie, a respected woman in Ontario Agriculture. She was speaking at an event by Chatelaine Magazine, and was explaining the dynamics of board leadership in agriculture. This same tweet prompted a great discussion between myself and my husband. Aaron sits on many boards. He was asked to sit on every one of them them by experienced board members and executives. We listed off many of the (male) board members that we know. They were all asked to sit on boards. The local director for our Saskatchewan Cattlemen’s Association was first asked to run for that board. I have never been asked to sit on a board. The very long list of my confident, accomplished female friends have never been asked to sit on boards. This was a pretty simple light bulb moment for both of us. Board members need to be aware and look for great future board members of BOTH genders. It was a great discussion, one that Mr. Hursh did not seem to find in that quote. After receiving many questions and objections on Twitter, he then continued expanding on this opinion in a piece for a mainstream newspaper. Read it here. Over the course of the past week, I have written, then deleted, a snarky tweet response to Mr. Hursh at least a dozen times. I believed that a public spat over Twitter would do little good for myself, women in agriculture, or the industry as a whole. But upon reading his very public expansion, using terms such as victim mentality, I could no longer remain quiet. 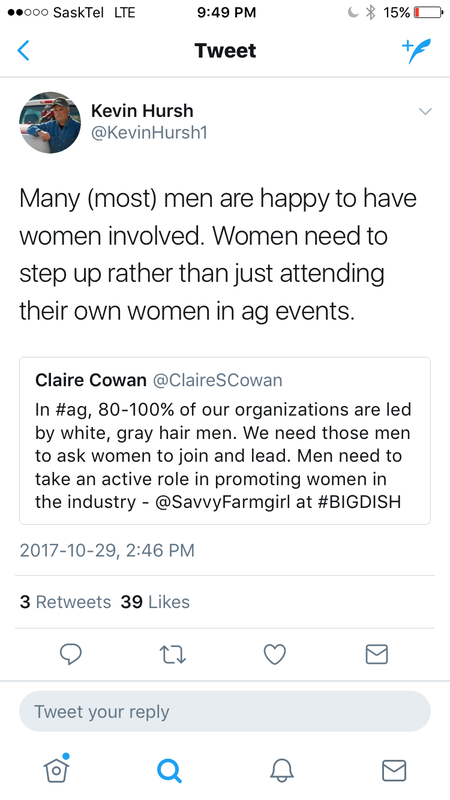 Since Kevin is (very obviously) not a woman in agriculture, I though that perhaps he could benefit from some context of what being a woman in today’s Ag industry actually looks like. Allow me to share some stories. A woman is told that the retail she is managing will quickly go to hell with a woman running the place – they would have been better with a toddler manager. The three other men in the office laugh and laugh, and comment that perhaps she best run the fertilizer blender in a skirt and heels. In the best interest of keeping the customers happy, of course. A man quietly walks (sneaks?) into a woman’s office while her back is turned to the door. He grabs her shoulders and proceeds to move his hands towards her chest. He is surprised at her anger, and makes comments about her need to “keep her customers happy” and to “not make trouble.”. A woman is demoted for taking the standard maternity leave that the law affords her. With no warning and no discussion she is moved from a sales rep to a junior associate. A woman is at a commodity group meeting. She is told by three different men how odd it is that she is at the meeting instead of her husband. Would she not have been better off caring for the children so that he could be there? Do you think that these are isolated occurrences? Are these old school instances that no longer happen? Well, let me fill you in on a little secret. They were all me. Every single one. I am a woman in agriculture, and, at under forty, a fairly young one at that. That last example? It was last week. The truth is that I have never spoken of these before. I have not complained or tattled, whined or whinged. I took each incidence for what it was, and made sure to make the best of each one. Sometimes you can laugh it off. Sometimes a fuss must be made. I know that I am not alone in these experiences. Just as I know that they have not ceased to occur. These instances, and my response to them, are experiences that I can share with younger women. Women who may not have my confidence, or my network to fall back on. Of Kevin’s opinion piece, I can point out some glaring mistakes. He did not get pulled into this discussion. He inserted himself into it, after reading a single tweet that he had no context behind. His generalization that “many women just aren’t interested in rural municipal politics or one of the many crop commissions” is pretty far off base, in my slightly more expert opinion. The women that I talk to are very interested. They are struggling to see the path onto many of these boards, for a multitude of reasons. I had the confidence to tell the grey hairs that I deserved to attend our regional meeting. I can only imagine their shock if I ran for a position. Fear of failure is not a reason to hold back, but it is a wall that needs to be climbed in order to move forward. Climbing such walls takes time, and an incredible amount of confidence. Kevin believes that these barriers are based on perception not reality, yet they still seem to leave a mark when we run ourselves into them. Mr. ﻿Hursh, I would like to believe that your intention was to inspire women to step up, rather than to tear down events and organizations that many women see value in, but let me assure you, that message was lost in your condescension. So here I am, as a confident, competent woman in agriculture, telling you, Kevin Hursh, that you do not get to tell me what it is that I need. There are many areas that I could learn from you and your valuable experience, but the struggles of being a woman is not one of them. Women and their personal experiences are as diverse as this amazing industry is. There is no one right answer in creating more balanced leadership. What does not help is bashing options. I, myself, have not attended many women focussed Ag events, but I would never belittle them as an option for those who seek their value. It is in the best interest of agriculture as a whole, for our boards and commissions to be diverse in both opinions and gender. It is a problem that they are currently not. Many issues require many solutions, but let’s all try to be part of the solution rather than the grey haired problem. Argued with excellence, integrity and clarity. Thank you so much Merle! I am so sorry your experiences were like this. It is a very honest and real telling of what you had to endure, and o would have taken a lot of bravery to write. I commend you for finding that strength to share the unsharable. My most negative experiences were courtesy of women, not men. These awful ppl come in both sexes unfortunately… adding further to the complexity of fixing the recurring problems. That said, someone had faith in you to give you the roles you’ve had. Never forget that. There are always people seeing the good, rooting for you, wanting you to succeed. Don’t let those who try to blow out your candle have the last laugh. You’ve got this. Brave and well articulated. Thank you for sharing so much of yourself on many issues, not just this one. This woman in agriculture appreciates it and is here to support and give you a hand up, a high five or a virtual hug any time. Maybe more people of both sexes could consider that approach to make our sector stronger. Thank you Crystal. It means so much to me to have you and so many other amazing ladies in my corner!! Thank you for sharing Adrienne. It is important that these events get the light of day shone on them because most people are not exposed to the worst. We are all exposed to the most insidious, the “light hearted joke” that is not okay. Even if the one saying it is “just having fun.” That is the kind of stuff that allows the worse to occur. And it takes courage to call it out too. To all women (and men), beginner and experienced wondering about getting involved on boards and committees: Get after it. Look around at the amount of elections on commissions and boards (few, mostly acclamations). They are looking for willing, dedicated people. You don’t have to be an MBA. The (legal) expectation is that you do the best with your abilities. And they know people won’t do this for free, most compensate. The smaller ones may not be able to. Talk to the CEO or ED of the organization you are interested in. While there may be societal barriers, bad past experiences or other things that give pause, the boards I have been exposed to are hungry for any new members willing to put in the time and effort to better the industry. Adrienne, I believe your family gives above average time and energy to improving the agriculture world. Thank you. Very well said. It is interesting how we as women have to think before proceeding. Learning how to judge the type of male we are going to have to deal with. I learned many decades ago how respond to certain male individuals is many professions. Starting conversations at the parts desk with “my husband needs”. Same with phone conversations. It’s much better than It used to be but some men are still very “rude”. Recently I had the misfortune to have one that I would say has been the worst ever situation. Construction on our road resulting in a bridge being replaced. Contractor came needing access to the land. Husband told him you have to talk to my wife it’s her land her decision. Man said I’ve never dealt with a woman that owns land. Whole thing was a disaster. The contractor REFUSED to communicate with me. Thankyou for taking the time to write this piece. There are many of us gray haired guys who need to remember the great value in listening and learning. And we need to be reminded on occasion. Well done. We need to step up and demand our place at the table. Don’t be shy and don’t give up. Don’t wait to be asked. Next time there’s an opening, nominate yourself, or get an ally to nominate you. Run a campaign, Often these positions are filled by acclamation. Persistence pays. And then, once you’re at the table, you still have to battle the sexism, condescension, antagonism and downright stupidity. The important thing is to be confident that you belong there, your perspective is desperately needed at those meetings, and you have every right to speak and be heard. Every time one woman breaks through the barrier, it makes it possible for the next ten to get through as well. Nellie Mcclung said “Never retract, never explain, never apologize; get things done and let them howl.” So go ahead, I’d like to hear some howling from the ag sector.